This is the city or Creole version of the great Louisiana Courtbouillons, the other being the Cajun Catfish Courtbouillon (COO-be-yahn). The major difference in my two versions is the absence of a Roux in this one and of course the type of fish. I actually used Red Snapper for this version. Although Redfish is preferred and classic, I went with what I could get freshest. Stop and have a bowl of redfish courtbouillon, a dish that is to the bayous and marshes and Gulf coast what a hamburger is to the Midwest. A rich brown roux has been made and combined with tomato puree, onions, shallots, garlic, celery and bell pepper. Bay leaves and allspice and red pepper and other spices have been added, and a dash of Tabasco. 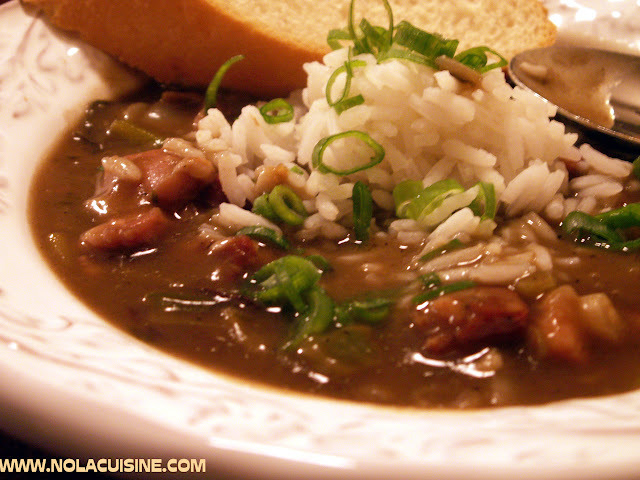 Redfish meat and a bit of claret have been put in and simmered gently for an hour, and the courtbouillon is served in a gumbo bowl with rice. It is red and thick and searing, and just one taste of it makes you imagine that you can stand up even to the weather. 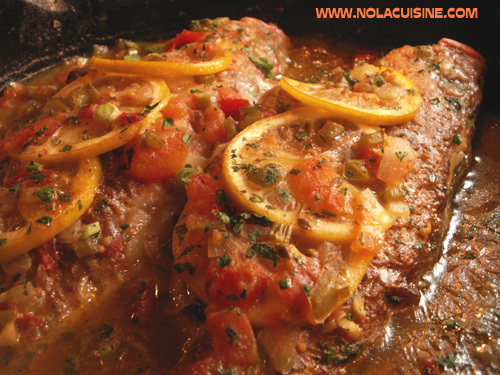 When making your Creole Sauce for this recipe be sure to make it extra thick, otherwise the liquid the fish lets out while cooking will make your sauce watery. Season the fish all over including in the cavity with kosher salt, black pepper and a little cayenne. Place some of the sliced lemon and 1/2 of the Thyme into the cavity of each fish. 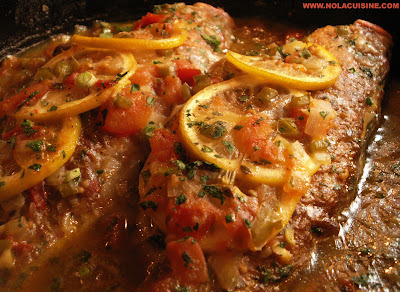 Dredge the fish in the seasoned flour and warm the unsalted butter in a large cast iron skillet. When the butter just starts to brown place the fish in the pan, cook until golden brown on both sides. Remove the fish to a plate and deglaze the pan with the white wine. When the wine reduces slightly, add the fish back to the pan and ladle enough Creole Sauce to come up the sides of the fish by half, plus ladle a little on top of the fish. 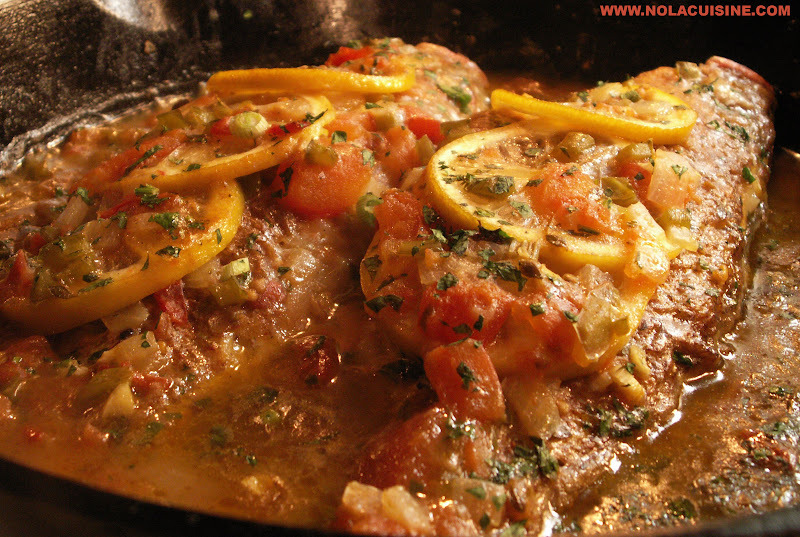 Add the Thyme and bay leaf to the pan and place some of the lemon slices on top of the fish. Cover the pan with a lid or aluminum foil and place into a 350 degree over for 30 minutes. When plating, carefully remove the fish and filet gently being careful to get rid of all of the bones. An alternate method would be to filet the fish raw and use the head and bones to make your fish stock. Serve with Creole Boiled Rice and garnish with chopped parsley, lemon slices, and a genourous helping of the Creole Sauce from the pan. Serves 2-4 depending on the size of your fish. 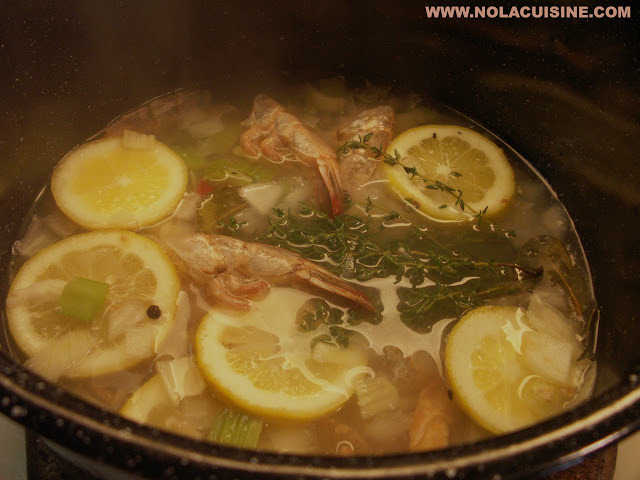 Be sure and check out my ever growing Index of Creole & Cajun Recipes which is a directory of all of the recipes featured on this site!